1. Babor, T et al. 2009, Drug policy and the public good, Oxford University Press, Oxford. 2. Babor, T et al. 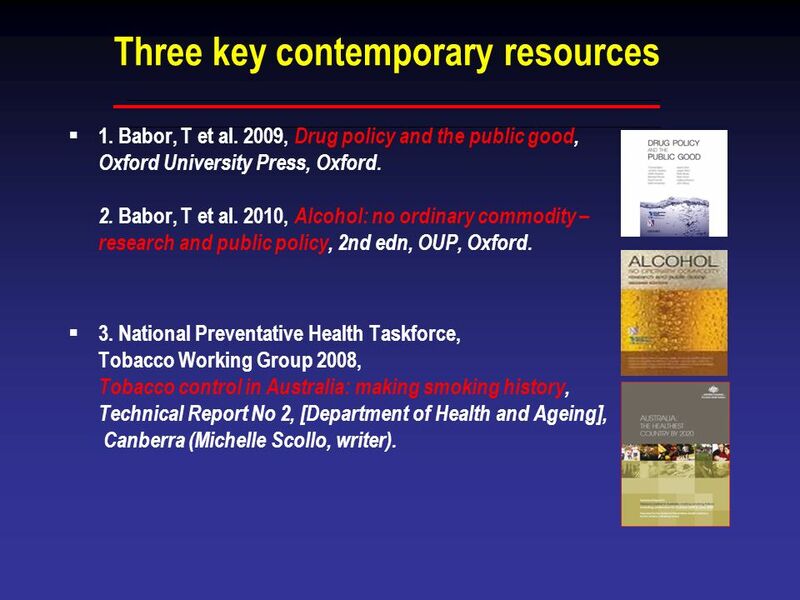 2010, Alcohol: no ordinary commodity – research and public policy, 2nd edn, OUP, Oxford. 3. National Preventative Health Taskforce, Tobacco Working Group 2008, Tobacco control in Australia: making smoking history, Technical Report No 2, [Department of Health and Ageing], Canberra (Michelle Scollo, writer). 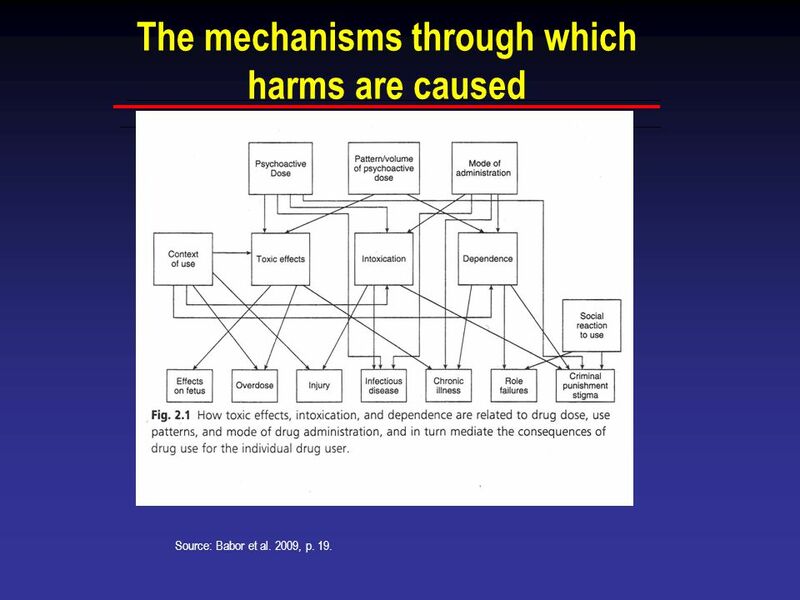 Diagram from DP p. 19 harms from dose, use patterns & mode of admin – also deal with toxicity, psychoactive/intox effects & dependence Also deal with context & expectancies and social reactions: drug set & setting Bases of risk: some in DP p. 15: natural or synthetic, how ingested, any medical use, consumption patterns, drug combinations, situational factors, behavioural factors. Source: Babor et al. 2009, p. 19.
International Conventions (treaties) E.g. 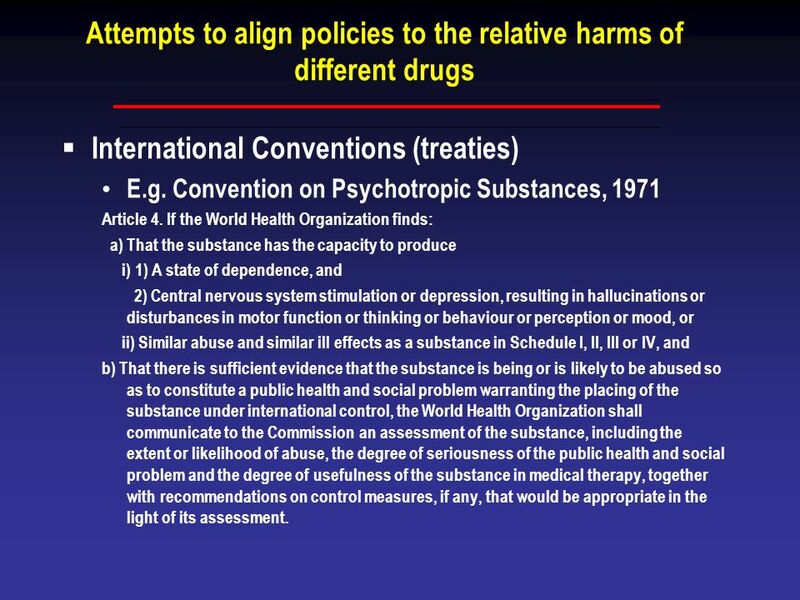 Convention on Psychotropic Substances, 1971 Article 4. 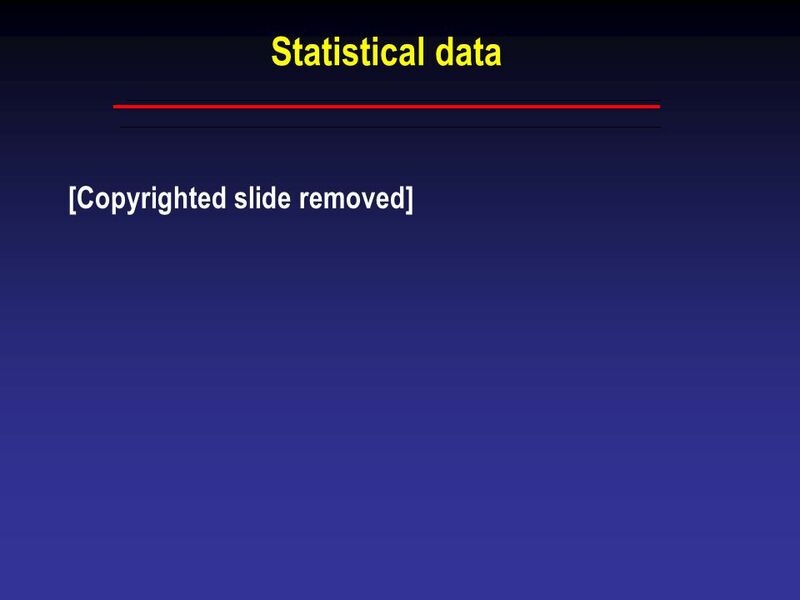 If the World Health Organization finds: a) That the substance has the capacity to produce i) 1) A state of dependence, and 2) Central nervous system stimulation or depression, resulting in hallucinations or disturbances in motor function or thinking or behaviour or perception or mood, or ii) Similar abuse and similar ill effects as a substance in Schedule I, II, III or IV, and b) That there is sufficient evidence that the substance is being or is likely to be abused so as to constitute a public health and social problem warranting the placing of the substance under international control, the World Health Organization shall communicate to the Commission an assessment of the substance, including the extent or likelihood of abuse, the degree of seriousness of the public health and social problem and the degree of usefulness of the substance in medical therapy, together with recommendations on control measures, if any, that would be appropriate in the light of its assessment. 163 word sentence! 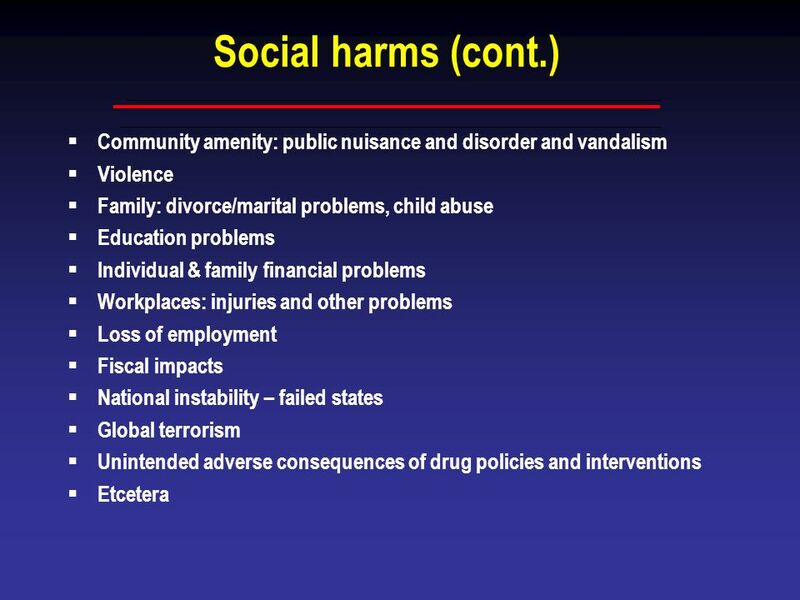 It is not just the chemical characteristics of the drugs that determine harm, but also how drugs are used, drug interactions, society’s responses to drugs and people who use drugs, etc. 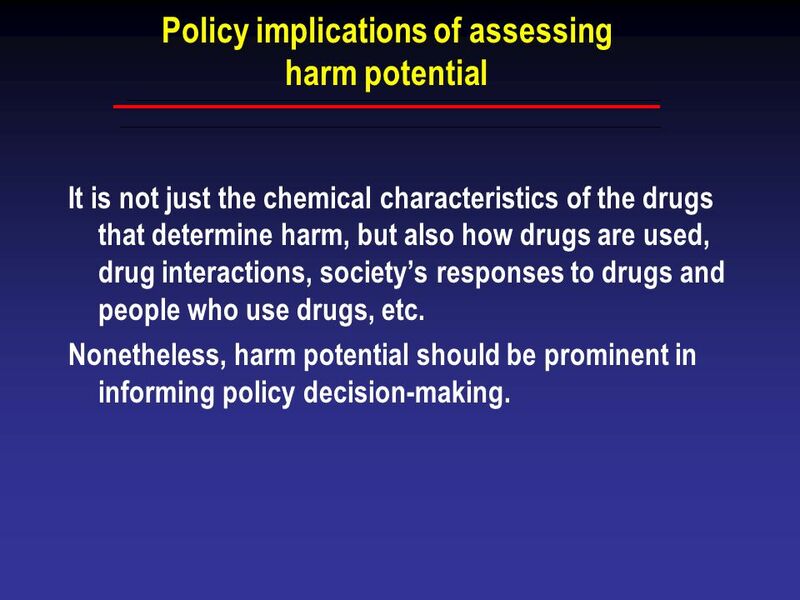 Nonetheless, harm potential should be prominent in informing policy decision-making. Disability-Adjusted Life Years (DALYs) 2003 Combine mortality, morbidity & disability Do not cover the ‘hidden harms’, i.e. 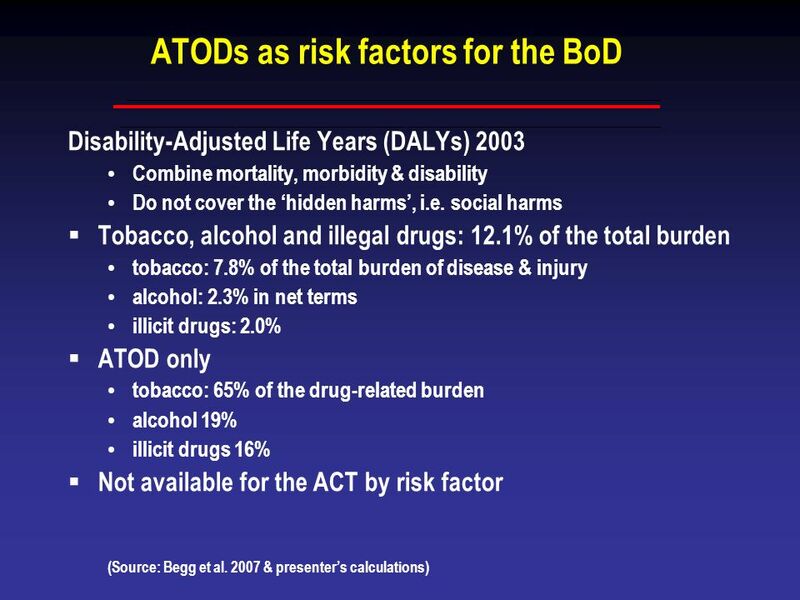 social harms Tobacco, alcohol and illegal drugs: 12.1% of the total burden tobacco: 7.8% of the total burden of disease & injury alcohol: 2.3% in net terms illicit drugs: 2.0% ATOD only tobacco: 65% of the drug-related burden alcohol 19% illicit drugs 16% Not available for the ACT by risk factor (Source: Begg et al & presenter’s calculations) Some will be surprised at the relatively high impact of illicit drugs, up there with alcohol. The largest component within the illicits is 'heroin & polydrug abuse' (33% of the burden attributed to illicit drugs) which is largely the impact of illicit drug-related mortality. This is followed by the impacts of hepatitis C (23%), with cannabis abuse, suicide & self-inflicted injuries, hepatitis B, benzo abuse and 'other' each contributing 10% or less. 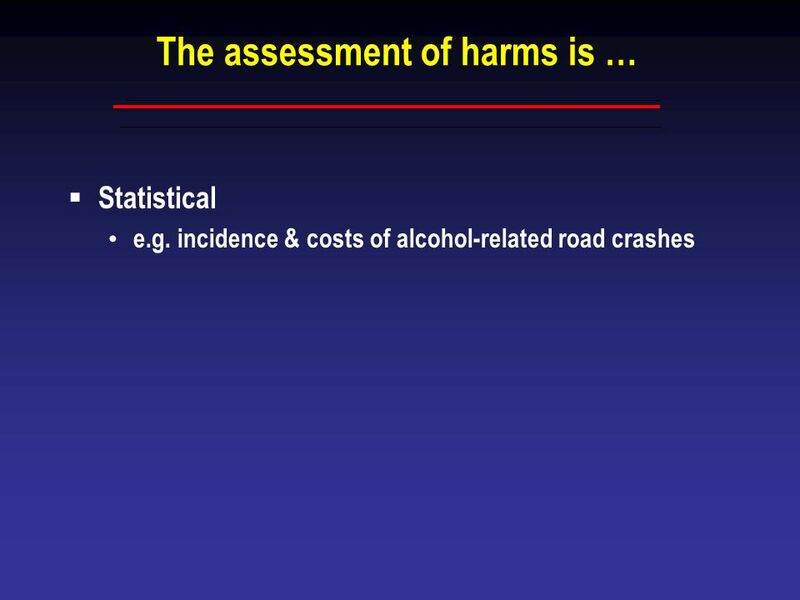 Type of harms/costs, e.g. 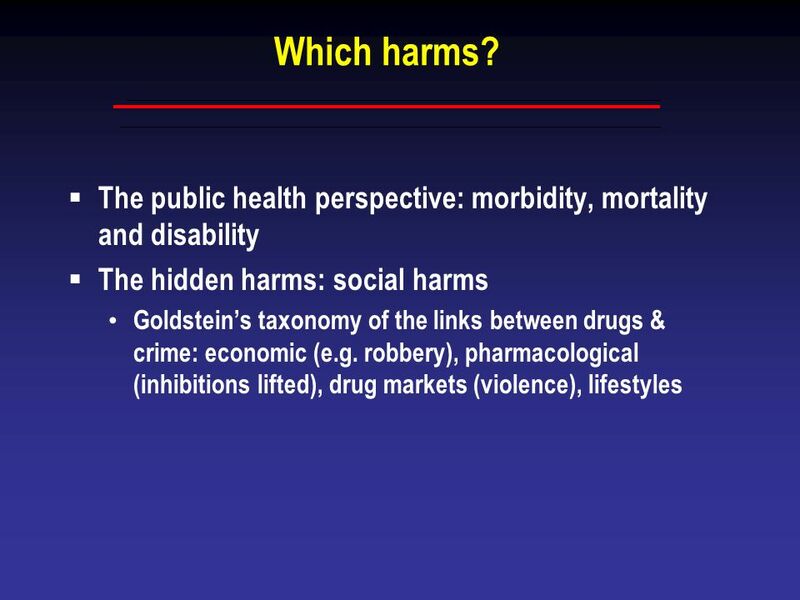 Who bears the harms/costs Sources of harms/costs Users, dealers, intimates, employers, neighbourhood, society, etc. Drug use, legal status, interventions, etc. 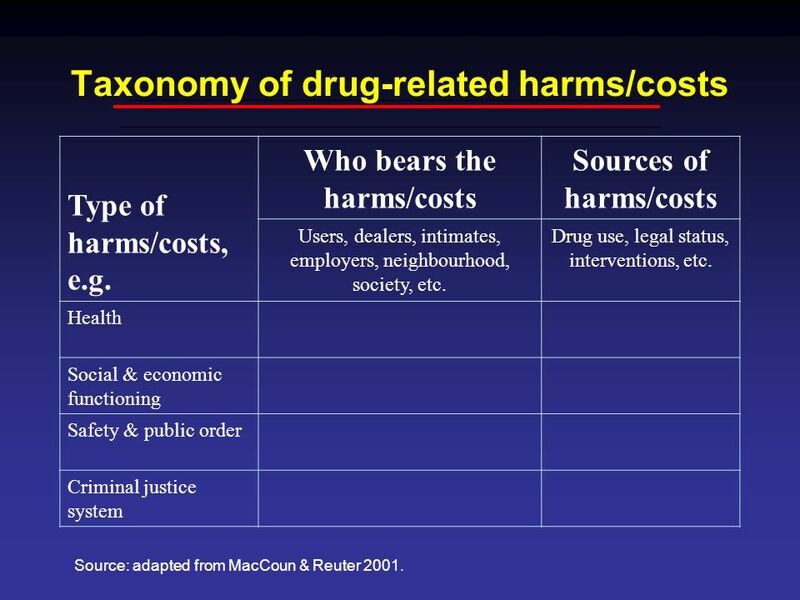 Health Social & economic functioning Safety & public order Criminal justice system This matrix applies in a particular policy setting, for a particular drug or combination of drugs – so five dimensions in all Note that sources of harm in MacCoun et al. are use, illegal status & enforcement which too limited – Rx & prevention can/could also produce unintended negative outcomes It helps to identify the policy levers and policy instruments Incomplete and needs complexifying - how deal with interactions? Gateway dynamics? 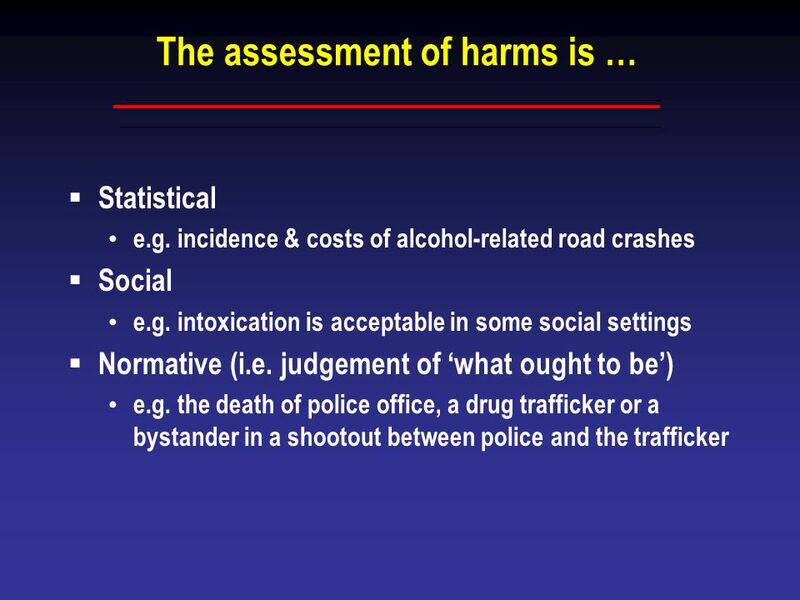 Challenges in assessing harms include which harms, poor data on the magnitude of the social harms, no common metric for measuring and comparing harms except for dollars but we don't have the date on this (MacCoun et al 1996 p338) Source: adapted from MacCoun & Reuter 2001. 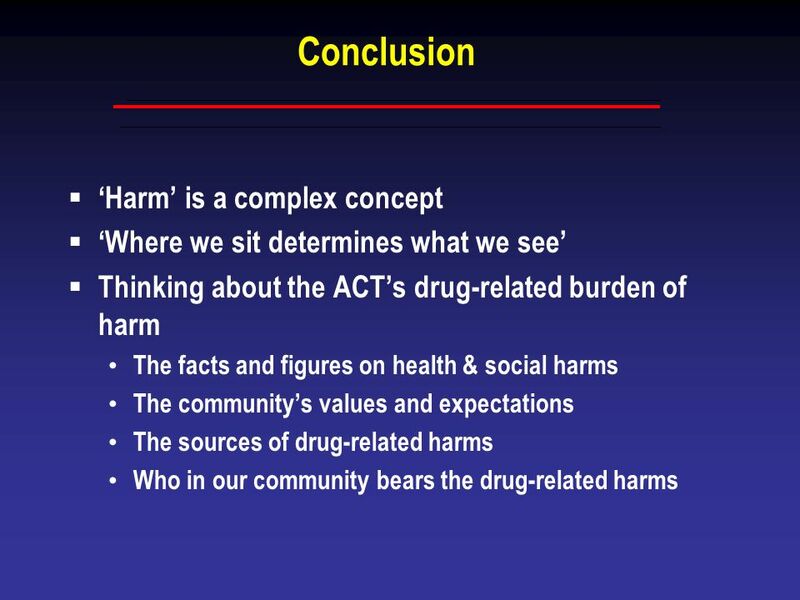 ‘Where we sit determines what we see’ Thinking about the ACT’s drug-related burden of harm The facts and figures on health & social harms The community’s values and expectations The sources of drug-related harms Who in our community bears the drug-related harms A discussion of burden of harm should lead us to think critically about how complex the concept of harm really is. It leads us to think about how ‘where we sits determines what we see’, that is the social and value issues that relate to identifying and determining the extent and nature of harms, independent of any statistical, factual way of thinking about harms. 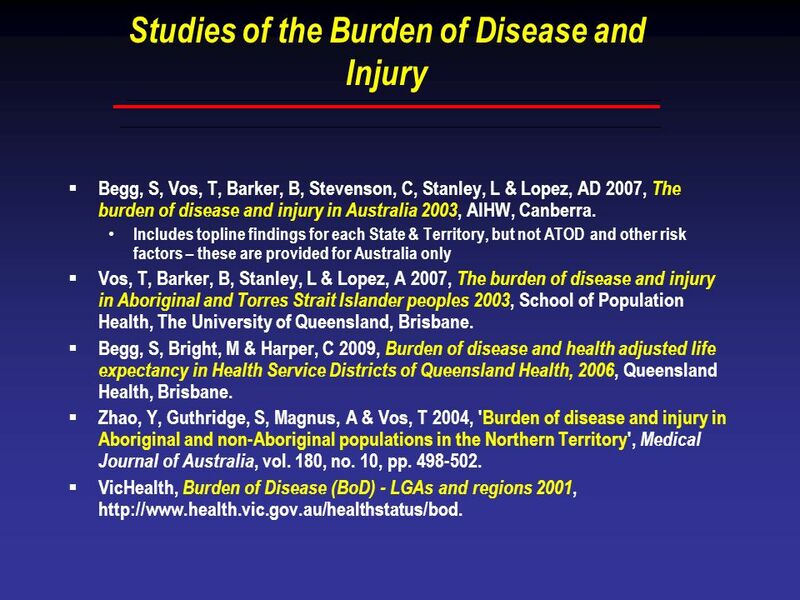 Unpacking the idea of burden of harms draws attention not only to the extent and nature of harms, but also to the particular harms to be included in our overview. It draws attention to how the sources of those harms are found in the drugs themselves, in drug use, and in societal responses to drugs, drug use and people who use drugs. It draws our attention to who actually bears the harms. Although this is complex, that is the reality of addressing drugs in the ACT community. The type of approach that I have presented -- we can call it a type of policy analysis -- has potential for helping us to select the levers or policy instruments that are going to be most effective and most cost-effective. 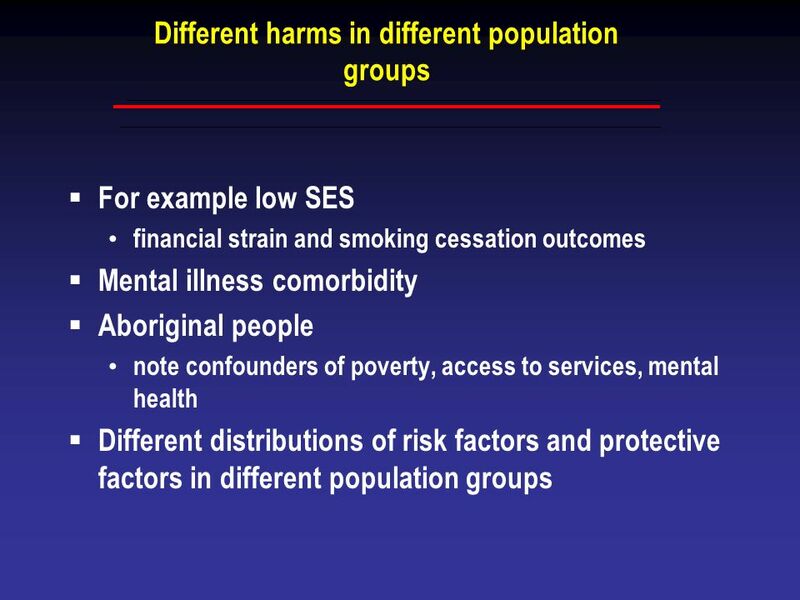 Such a policy analysis will only work, however, if it deals with both the statistical evidence and with our community’s norms about which harms, borne by whom, need to be addressed, and what might be the thresholds that shift particular types of harm from a low priority category into high priority category. And that will be one of the challenges for the next ACT Alcohol, Tobacco and Other drug Strategy. 18 Sources and notes (1) Babor, T et al. 2010, Alcohol: no ordinary commodity - research and public policy, 2nd edn, OUP, Oxford. Babor, T et al. 2009, Drug policy and the public good, Oxford University Press, Oxford. Bennett, T & Holloway, K 2009, 'The causal connection between drug misuse and crime', British Journal of Criminology, vol. 49, no. 4, pp Goldstein, PJ 1985, 'The drugs/violence nexus: a tripartite conceptual framework', Journal of social issues, vol. 15, no. 4, pp Kendzor, DE et al. 2010, 'Financial strain and smoking cessation among racially/ethnically diverse smokers', American Journal of Public Health, vol. 100, no. 4, pp Kleiman, MAR 1992, Against excess: drug policy for results, Basic Books, New York, NY. Kleiman, MAR 2009, When brute force fails: how to have less crime and less punishment, Princeton University Press, Princeton. MacCoun, R, Reuter, P & Schelling, T 1996, 'Assessing alternative drug control regimes', Journal of Policy Analysis and Management, vol. 15, no. 3, pp MacCoun, R & Reuter, P 2001, Drug war heresies: learning from other vices, times, and places, Rand Studies in Policy Analysis, Cambridge University Press, Cambridge, UK McKie, J & Richardson, J 2003, 'The rule of rescue', Social Science and Medicine, vol. 56, no. 12, pp Mrazek, PJ & Haggerty, RJ (eds) 1994, Reducing risks for mental disorders: frontiers for prevention intervention research, National Academy Press, Washington DC. 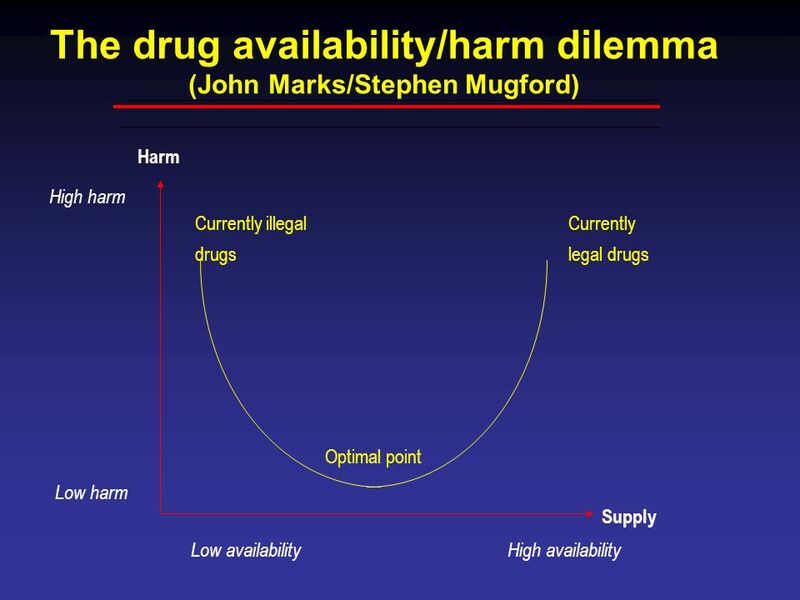 Mugford, S 1991, 'Drug legalization and the 'Goldilocks' problem: thinking about costs and control of drugs', in MB Krauss & EP Lazear (eds), Searching for alternatives: drug-control policies in the United States, Hoover Institution Press, Stanford, Calif. Mugford, S 1993, 'Harm reduction: does it lead where its proponents imagine?' in N Heather, A Wodak, EE Nadelmann & P O'Hare (eds), Psychoactive drugs and harm reduction: from faith to science, Whurr, London. 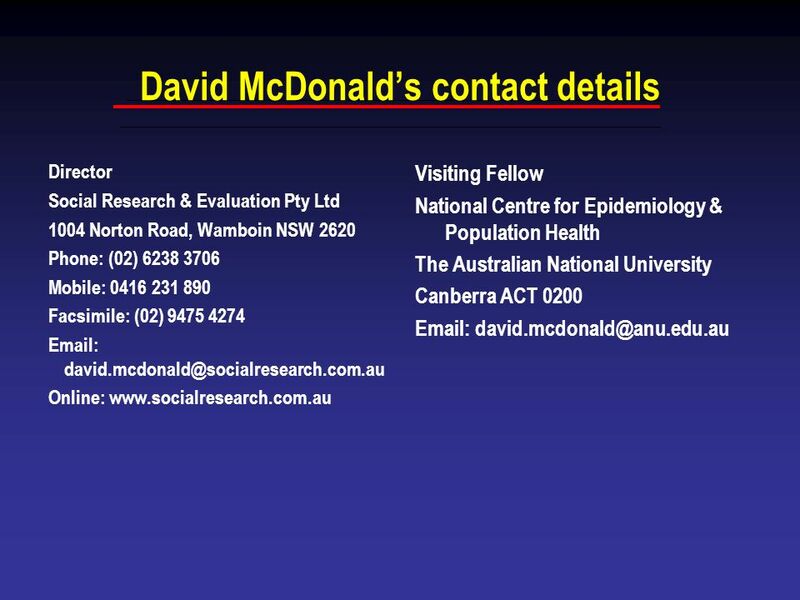 National Preventative Health Taskforce, Tobacco Working Group 2009, Tobacco control in Australia: making smoking history, Technical Report No 2, including addendum for October 2008 to June 2009, [Department of Health and Ageing], Canberra, writer: Michelle Scollo. 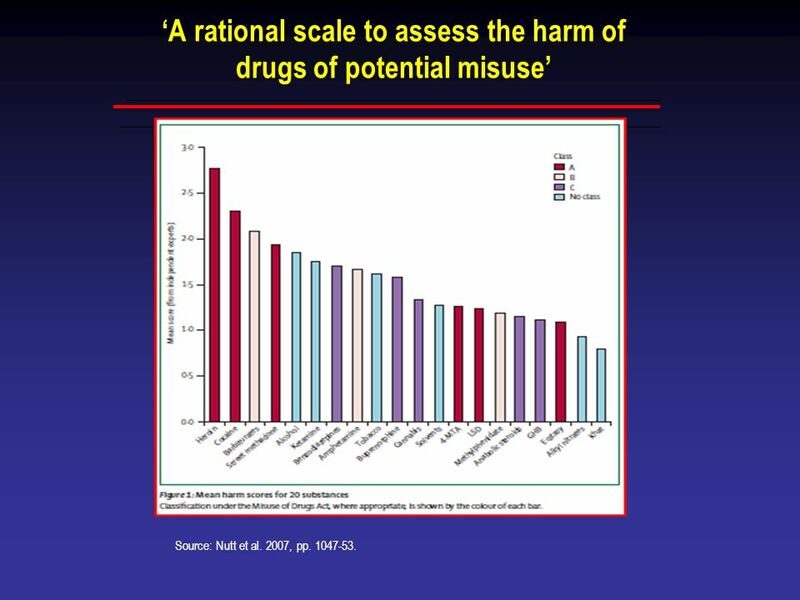 Nutt, D, King, LA, Saulsbury, W & Blakemore, C 2007, 'Development of a rational scale to assess the harm of drugs of potential misuse', The Lancet, vol. 369, no. 9566, pp Roche, AM 1997, 'The shifting sands of alcohol prevention: rethinking population control approaches', Australian and New Zealand Journal of Public Health, vol. 21, no. 6, pp Rose, G 1981, 'Strategy of prevention: lessons from cardiovascular disease', British Medical Journal (Clinical Research Ed. ), vol. 282, no. 6279, pp Rose, G 1992, The Strategy of Preventive Medicine, OUP, Oxford. 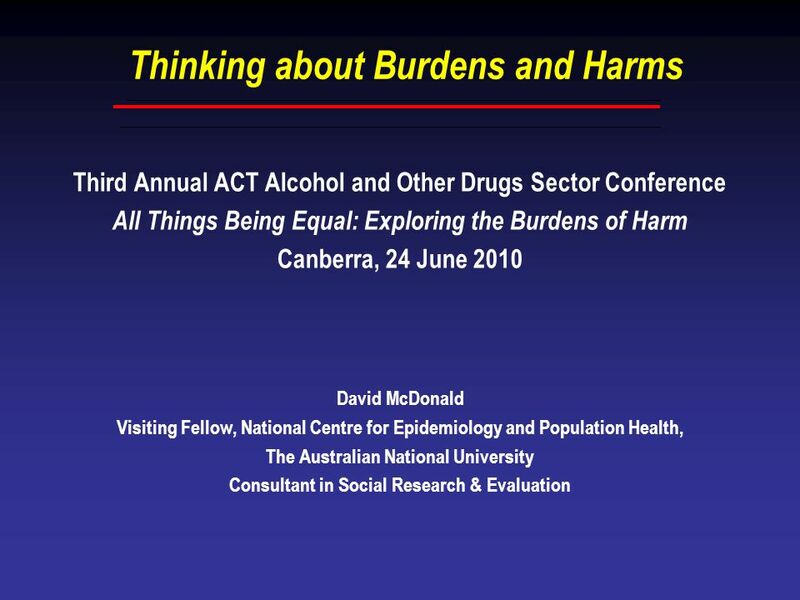 Download ppt "Thinking about Burdens and Harms"
The need to challenge unhealthy drug policies to improve drug treatment Dr Chris Ford, Holly Catania and Rebecca Murchie IDHDP. The development of the equalities scheme in the Crown Prosecution Service Shehla Husain Equality and Diversity Unit 12 April 2007. 1 Chronic Disease Prevention: The Power of Public Health By Dr. John Frank, Scientific Director, CIHR-Institute of Population & Public Health 11 th World. Participatory monitoring and evaluation of joint management in the Northern Territory: Challenges and Lessons Central Land Council Natasha Stacey & Arturo. 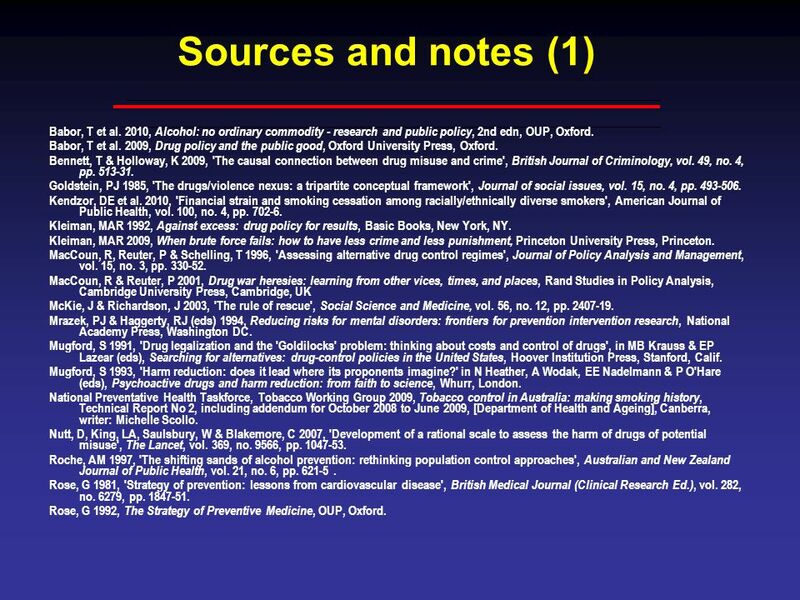 The purpose of alcohol guidelines, and the history of their development in Australia Robin Room Editor-in-Chief, Drug & Alcohol Review; Centre for Research.